Harriet Jacobs was an African-American, born into slavery in North Carolina in 1813. She thwarted the sexual advances of her master for years until she escaped and hid in the attic crawl space of her grandmother's house for seven years before escaping north to freedom. She published an autobiography of her life, Incidents in the Life of a Slave Girl, which was one of the first open discussions about sexual abuse endured by salve women. She was an active abolitionist, associated with Frederick Douglass, and, during the Civil War, used her celebrity to raise money for black refugees. After the war, she worked to improve the conditions of newly-freed slaves. As a former CIA agent who has seen the horrors and carnage of war, Timothy Ballard founded a modern-day "underground railroad" which has rescued hundreds of children from being fully enslaved, abused, or trafficked in third-world countries. His story includes the rescue and his eventual adoption of two young siblings--Mia and Marky, who were born in Haiti. 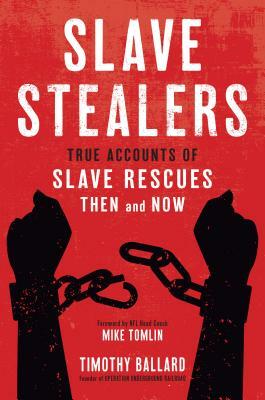 Section 2 features the lives of five abolitionists, a mix of heroes from past to present, who call us to action and teach us life lessons based on their own experiences: Harriet Tubman--The "Conductor"; Abraham Lincoln--the "Great Emancipator"; Little Mia--the sister who saved her little brother; Guesno Mardy--the Haitian father who lost his son to slave traders; and Harriet Jacobs--a teacher for us all. Timothy Ballard earned his MA in international politics from the Monterey Institute of International Studies. He worked as a Special Agent for the Department of Homeland Security. He is the founder and CEO of Operation Underground Railroad, which rescues children from child-trafficking organizations throughout the world. The best-selling author of The Lincoln Hypothesis, he recently received the distinguished George Washington Honor Medal from the Freedoms Foundation at Valley Forge. Tim is married and the father of six children.